← To the library! For comix! A few years ago, during a BBC attempt to find the nation’s best sitcom, Armando Ianucci was asked to make the case for ‘Yes, Minister’. In the excellent documentary that followed, Ianucci discovered that one of the reasons ‘Yes, Minister’ holds up so well is that the creators went back over the news archives for the past 50 years and analysed what stories recurred, and than based their episodes around these themes – the special relationship, the EU, expenses and honours scandals, arts funding, civil service waste. Hence it still seems fresh and relevent today. Ianucci went on to nick this idea wholesale for ‘The Thick Of It’. You can very easily do the same thing when writing about English football. When I was researching a piece on 40 years of London football for Time Out‘s (very fine) ‘London Calling’ book, I discovered familiar arguments being made twenty or thirty years ago. ‘Football has been taken away from its natural community, commercialised and given the worst trappings of Hollywood by the mediam,’ wrote Peter Ball in 1974. What would he make of it now? I was reminded of this when I was handed half-a-dozen old newspapers from 1973, covering the aftermath of England’s infamous World Cup failure at the hands of Poland. England had followed up that result with a 1-0 defeat at Wembley against Italy in November, prompting some very familiar comments in the papers. 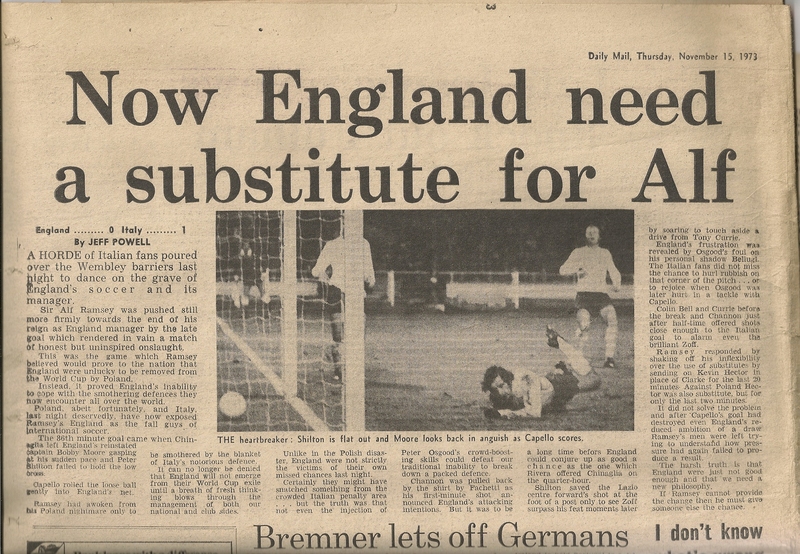 ‘Now England need a substitute for Alf’, said the Daily Mail (and press nerds will be interested to note that the hated ‘Now’ to pad out a headline was already in use at this time). But the press weren’t interested in excuses, they wanted blood. And they got it. Ramsey lasted one more game, a 0-0 draw against Portugal, before he was sacked. Astonishingly, England’s internationals didn’t suddenly develop greater flair and technique as a consequence. And who scored the crucial goal for Italy that night in November? Do I really need to say? Arrivederci Fabio, it was always going to end this way, eventually. This entry was posted in Football, History, Journalism and tagged Alf Ramsey, Armando Ianucci, England, Fabio Capello, Italy, Poland, Wembley, Yes Minister. Bookmark the permalink.